bone loss is unclear but may relate to the activation of biomechanical forces that limit the rate of further bone loss when the amount of cancellous bone falls below some critical level. As the rapid bone loss phase subsides, serum levels of PTH increase progressively throughout the remainder of life. Markers for bone turnover also increase and these increases are directly correlated with the increase in serum PTH (Table 2). Suppression of PTH secretion by intravenous calcium infusion abolishes the differences in bone resorption markers between young and elderly women (Ledger et al 1994), strongly suggesting that the increase in bone resorption in ageing women is PTH-dependent. Also, a chronic, high calcium intake will also reduce elevated values for serum PTH in elderly women into the premenopausal range (McKane et al 1995). Thus, a considerable body of data implicates secondary hyperparathyroidism as the cause of the late slow phase of bone loss in elderly women. The secondary hyperparathyroidism has traditionally been assumed to be secondary to age-related factors that impair calcium absorption and renal Ca2+ homeostasis. However, the recent findings that the increases in both serum PTH and bone resorption in late postmenopausal women can be normalized by oestrogen replacement suggests that oestrogen deficiency may play a causal role (McKane et al 1997, Khosla et al 1998; Table 3). Samples are age-stratified and population-based. Postmenopausal women receiving oestrogen replacement are not included. There are age-related increases in serum PTH and in markers for bone formation (serum bone specific alkaline phosphatase [BSAP] and osteocalcin [OC]) and bone resorption (urine free pyridinoline [fPYD], and cross-linked N-terminal telopeptide of type I collagen [NTx]). Furthermore, the increases in biochemical markers are directly correlated with the increases in serum PTH. (Data are from re-analysis of study of Khosla et al 1997.) *P<0.0001, **P< 0.001. Serum intact PTH was fasting morning value. Bone resorption markers were measured by ELISA kit for N-telopeptide of type I collagen (NTx) and by fluorometric detection after HPLC for pyridinoline (PYD) and deoxypyridinoline (DPD). All results are mean SEM. For difference from premenopausal groups: *P < 0.05, **P < 0.005.
contrast, serum PTH levels increase progressively in the late slow phase of bone loss and are decreased by oestrogen treatment. 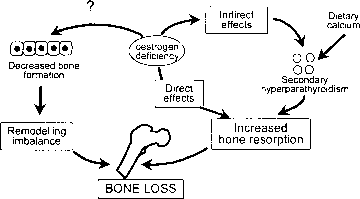 We have attempted to resolve this paradox by hypothesizing that oestrogen has two major effects on bone — a direct action on bone cells and an action on external calcium homeostasis that increases PTH secretion and indirectly increases bone loss (Riggs et al 1998). The loss of the direct effect of oestrogen on bone cells is responsible for the early rapid phase of bone loss. 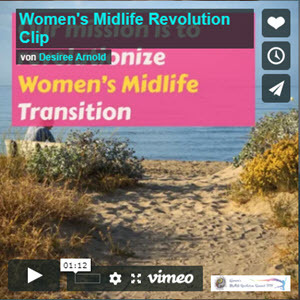 This direct effect is initiated by the large and relatively rapid fall in serum oestrogen levels at menopause, and it becomes less important after the rapid accelerated phase of bone loss subsides. In the late slow phase, the indirect effect of oestrogen deficiency on extra-skeletal calcium metabolism leads to the secondary hyperparathyroidism that is the major cause of the bone loss. The indirect effect is initiated by loss of oestrogen action on the intestine and kidney (Riggs et al 1998). The intestine contains oestrogen receptors and oestrogen stimulates calcium absorption (Gennari et al 1990). Oestrogen also increases renal calcium conservation (McKane et al 1995) through a PTH-independent enhancement of tubular reabsorption of calcium. During oestrogen deficiency, the loss of the intestinal and renal actions of oestrogen leads to external losses of calcium and negative calcium balance. Unless these losses of calcium are offset by large increases in dietary calcium (McKane et al 1996), they will lead to secondary hyperparathyroidism and continued bone loss. Both the early accelerated and the late slow phases of bone loss are associated with an absolute increase in bone resorption and a relative decrease in bone formation. Normally, there is a tight coupling of bone formation to bone resorption. 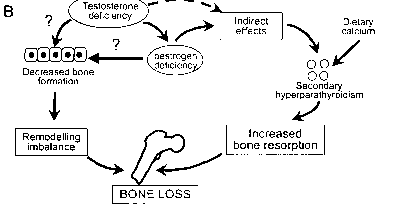 During oestrogen deficiency, however, there is a failure of a compensatory increase in bone formation to offset the increase in bone resorption and this leads to continued bone loss. 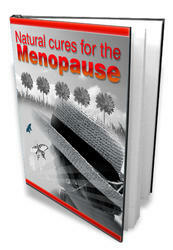 This abnormality is demonstrable soon after menopause suggesting that it is caused by oestrogen deficiency. Oestrogen has been shown to increase collagen synthesis in skin fibroblasts and to increase production of insulin-like growth factor (IGF)1 (Ernst et al 1989) and transforming growth factor (TGF)b (Ashcroft et al 1997), growth factors that are anabolic for osteoblasts. Also, oestrogen prolongs the lifespan of mature osteoblasts by decreasing apoptosis (Manolagas 2000). Oestrogen deficiency could also account for the impaired osteoblastic function in older women, although it is possible that age-related abnormalities in hormones or growth factors regulating osteoblast function also contribute. The probable mechanisms by which oestrogen deficiency produces bone loss in ageing women are shown in Fig. 2A.